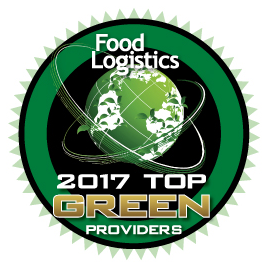 HICKORY, NC (June 20, 2017) – Transportation Insight, a multi-modal lead logistics provider and 2016 U.S. EPA SmartWay® Excellence Awardee, received recognition as a Food Logistics 2017 Top Green Provider. For the third consecutive year, Transportation Insight is included in this annual list of companies whose products, services or environmental stewardship promotes sustainability within the food and beverage industry. Transportation Insight was selected for helping food and beverage clients reduce their environmental impact by implementing multi-modal Enterprise Logistics solutions that provide optimal mode and carrier selection for efficient transportation operations that lower fuel usage, vehicle mileage and, as a result, air pollution emissions. Under its proprietary Extended LEAN® continuous improvement methodology, Transportation Insight helps food and beverage clients establish sustainable business practices and reduce their environmental impact through its Enterprise Logistics Solutions anchored in a robust suite of services that includes Supply Chain Analytics. Through the combination of Extended LEAN and the practice of continuous analytics, Transportation Insight creates and maintains an optimal network model from a data perspective. As a result, clients are able to minimize their supply chains’ carbon footprints through strategic network design, tactical transportation optimization studies and continuous improvement updates to maintain efficiencies. Client logistics operations leverage an ever-expanding carrier network to match freight and assets and minimize empty miles. Transportation Insight brings visibility to the end-to-end supply chain while collecting over 200 data points from each invoice using its proprietary freight invoice audit and payment system. This underpins comprehensive supply chain analysis that helps clients implement, monitor and maintain practices that reduce vehicle miles, air pollution emissions and energy consumption. The Lead Logistics Provider won the U.S. EPA 2016 SmartWay® Excellence Award for efforts in support of and complementary to SmartWay environmental goals such as effective collaboration, advanced technology and operational practices, a robust system to validate and report SmartWay data, communications and public outreach. Transportation Insight was one of two logistics providers to receive the 2016 award. Food Logistics’ annual Top Green Providers recognizes companies whose products, services, or exemplary leadership is enhancing sustainability within the food and beverage industry. Each year, the criteria for earning a spot on the list become more stringent for applicants. For example, the editorial staff evaluates a company’s participation in such programs as the EPA’s SmartWay and other recognized sustainability programs; facilities that are LEED-certified, and/or feature solar panels, LED lighting and other energy saving installations and retrofits that produce measure reductions in greenhouse gas emissions, to name a few. This year’s Top Green Providers list includes grocers, 3PLs, cold storage providers, pallet and packaging manufacturers, software and technology companies and others whose products and services are elevating sustainability to a competitive advantage. The Food Logistics 2017 Top Green Providers are showcased in the June issue, as well as online at www.foodlogistics.com.